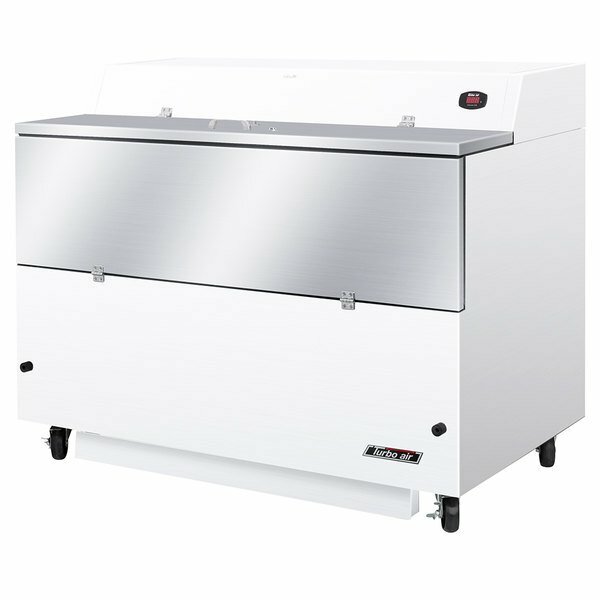 A great choice for any school lunch room, university dining hall, or cafeteria setting, this Turbo Air TMKC-58S-N-WA Super Deluxe 58" single sided white vinyl and stainless steel milk cooler with aluminum interior offers quick, easy self-serve beverage service. Capable of holding up to (16) 13" x 13" x 11" crates, this milk cooler keeps your cafeteria well stocked for the lunch rush. It also features a durable, white vinyl and stainless steel exterior with a corrosion-resistant aluminum interior to stand up to daily abuse from students. Plus, an external digital thermometer provides temperature readings at a glance. 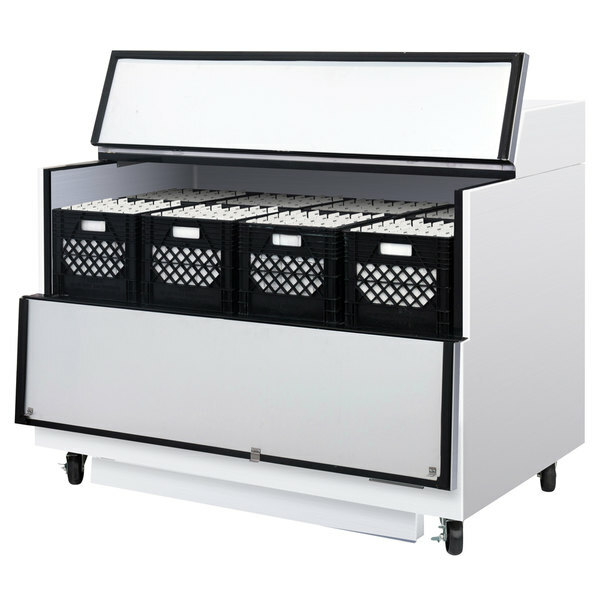 This cooler features a single-sided design for use against a wall or counter. Use it at the end of your food bar or beverage station to keep the lines moving and provide all of your students or customers with a selection of cold milk and other beverages. For enhanced security, this Super Deluxe model has a built-in door lock to prevent unwanted tampering. A 1/2 hp compressor runs on eco-friendly R290 refrigerant. This specialized refrigerant has an ozone depletion potential (ODP) of 0 and a global warming potential (GWP) of 3, making it an environmentally-responsible choice for your business. High-density polyurethane insulation increases the unit's structural strength and energy efficiency. A 115V electrical connection is required for operation.